Emergency Treatment of the HyperKPP and/or PMC Attack | Periodic Paralysis Intl. Hyperkalemic Periodic Paralysis and Paramyotonia Congenita can occur singly or in combination. While most attacks of Hyperkalemic Periodic Paralysis are brief and do not require emergency intervention, occasionally the serum potassium level will be high enough to cause cardiac distress, or muscle stiffness may interfere with respiration. Attacks of weakness in Paramytonia Congenita are usually mild to moderate in severity, but myotonia of chest, diaphragm and throat muscles can be life-threatening under some circumstances. Institute emergency treatment if EKG changes occur or serum K > = 7 mEq/L. 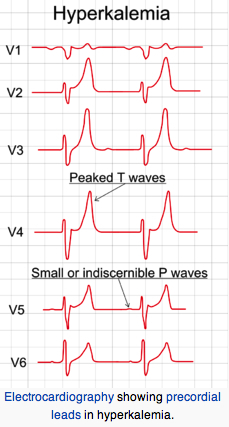 EKG change sequence: tall peaked T waves, diminished R waves amplitude, increased QRS or PR intervals and P wave disappearance. Slow infusion (over 5 min) of 10% calcium gluconate (reduces cardiac sensitivity to hyperkalemia). Sodium bicarbonate i.v. infusion to raise pH (lower H+) thereby lowering K+ via intracellular shift of H+ and K+ ions (H+ and K+ go in same direction). Infusion of 1 mg/kg D50W containing regular insulin 0.5- 1.0 unit/ml (drives K+ into cells). For severe hyperkalemia or weakness - inpatient with cardiac monitoring. Mild hyperkalemia or weakness - outpatient with close follow up. Be alert to possible complications: Cardiac arrhythmias, respiratory embarrassment. Patient may need respiratory support. Paramytonia Congenita (PMC) often occurs in combination with Hyperkalemic Periodic Paralysis. Attacks of weakness in PMC rarely progresses to frank paralysis and are usually normokalemic, but attacks of myotonia in chest, diaphragm and throat muscles have been reported which were severe enough to cause respiratory distress, and even loss of consciousness. These attacks have been precipitated by eating ice cream, jumping into cold water, getting chilled, or by the physical exertion of an asthma attack. Patients should work with the physician to determine whether myotonia is exacerbated or improved by potassium intake. In those whose attacks are hyperkalemic in nature an albuterol puffer or glucose gel (such as used by diabetics) should be carried and used at the first sign of an attack. For those whose myotonia is triggered by hypokalemia a 5-10 mEq dose of oral potassium may help to abort the episode. In the ER supportive measures and careful monitoring are recommended. Until potassium status can be determined the relative state of the serum potassium can be judged by assessing the EKG. The patient should be kept warm and IV hydration established. If the patient is unable to support the head or turn from side to side place them in a coma position to avoid aspiration.